Are you looking to get your roof inspected? In need of having those old windows replaced and upgraded? Maybe your looking for new house sidings? The put this Dickson Contractors Coupon Set to use! 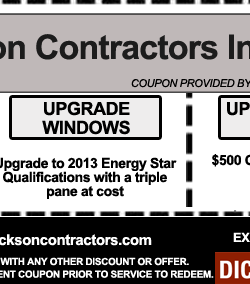 With this Printable Dickson Contractors Coupon Set you can get $500 off a complete roof tear-off, get a discount when upgrading your windows and get $500 off whole house siding!